It is the Third Design Wall Monday over at Patchwork Times this year Here. I have numbered my design wall Mondays to see if I can make about 40 this year. Even if I only have one little block to show you a hope to make my posts. I got to work on my red hearts on Sunday. 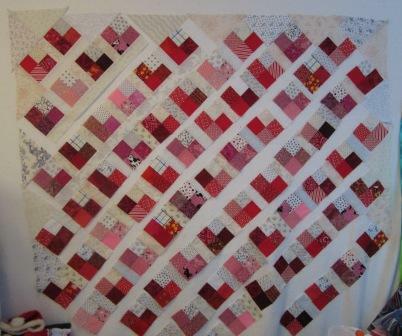 I made a post on Saturday about my Red scraps I have been working on part of the Rainbow Challenge 2012. Well I did OK in getting something more done. I got more red hearts and pink hearts completed and up on the design wall. I even sewed two rows together. My four patch hearts started with 2 1/2" cut units (hearts finish to 4"). I have decided to use 2" cut sashing. I am working very hard to keep to using my smaller scraps first. I had to go looking for more red. I then found so much pink I just had to add it in. For the neutrals I had some 2 1/2" units and then had to cut a few more. I then had to go looking for small fat quarters or small yardage of older neutral fabric. There is no way I want to buy anything for this quilt. Just part of the challenge for myself. My larger design wall still has Orca Bay Mystery on it and unchanged from last week. I guess I have slowed down on Orca Bay for the time being. Such a sweet little block! Very pretty! Wow, so many hearts and it looks like you are going to have a lovely quilt. I can see a lace flange on this to make it really girlie (don't pay any attention to me, I get carried away). I couldn't do that challenge as I have very few reds or pinks but an orange heart quilt is a possibility. Likely when you linked over on the Patchwork Times page you saw my Orca Bay...on my one and only design wall, and now so large I have to fold it back in order to put up new strips! Love your heart-y quilt, Cathy! Your hearts a cute. That's great you are getting it made just from your stash. I've pooped out on the Orca Bay quilt too - I really want to get the top done for the last link up though. so I better kick myself into action. Very pretty! I love scrappy and this one is perfect! Can't wait to see how you end up quilting this one. I like your little red hearts and I'm going to copy them. I have red left over so I'll be making at least a wallhanging to use up my red. I also like the Disappearing 4 patch that was posted. I want to do a few of those in different colors each month. I'm liking this challenge as it's shown me easy blocks to do that I had forgotten about. I did a DP4 block a few months back just to be able to remember it and it's on my design wall. (I look at it when I go up to my sewing room but did I think about that for reds this month? Duh, no! I think this would be real cute as a rainbow quilt. Anyway, I'm with you on the no buy too. I'm trying to use what I have. You are not talking to yourself, I'm listening now! Hi Cathy! Love your hearts quilt...though I am somewhat partial to anything with hearts on it! Keep up the great work. It is so fun to play with scraps and make do with what you have! Scrappy quilts are my favourite. Take care. Love the red hearts, very fitting! Oh, I love the red scrappy look with the hearts. I am so short of red scraps, I'm really envious! Lookin' good for sure. What a great way to make hearts, I love them. I'm still plugging away at Orca Bay - did a bunch more Ohio Stars yesterday. Next I'm back to finishing orange string blocks. I love these so they will go fast. I'm trying to only work on this without getting sidetracked, this is prob the longest I've stuck with one project so I'll see if I can finish it before I get distracted ha ha. On a side note do you have a time frame when you will do either of my quilts? There is no rush, just wondering. Your heart quilt is so perfect for this time of year. I'm glad to know I am not the only one Slowing down on Orca Bay.